EXCELLENT CONDITION MCCOY PEDESTAL MUGS! THERE ARE 4 IN THIS LISTING AND BOTTOMS ARE MARKED: 7112, MCCOY, LANCASTER COLONY (MARK), USA. MUGS ARE IN NEW, UNUSED CONDITION! 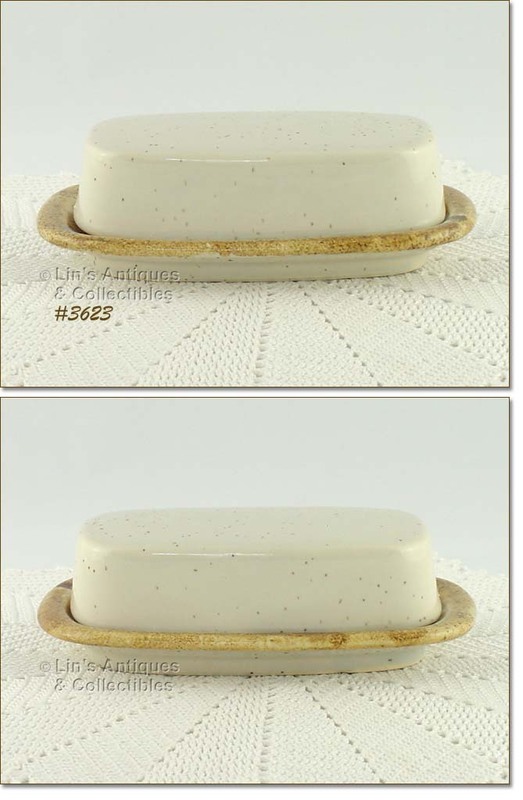 THIS LISTING HAS A MCCOY COVERED BUTTER DISH! 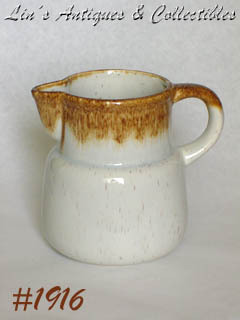 IT’S FROM THE GRAYSTONE DINNERWARE LINE AND BOTTOM IS MARKED: MCCOY, 7013, USA. IT’S IN SUPER CONDITION – NO CHIPS, NO CRACKS, NO CRAZING! 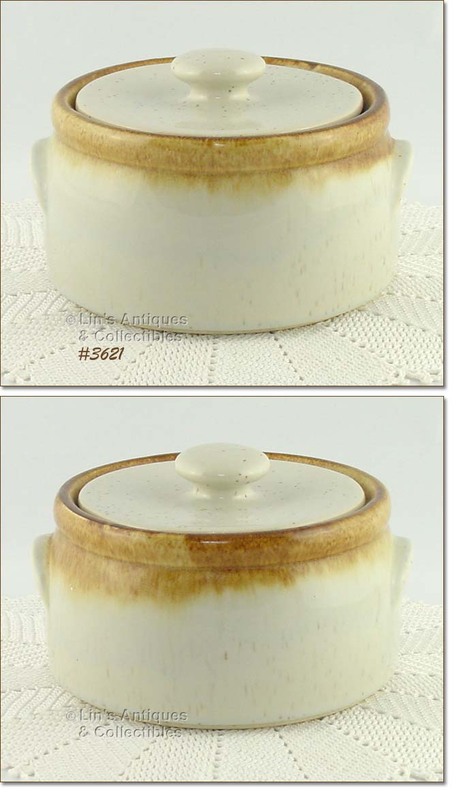 THIS LISTING HAS 4 INDIVIDUAL SIZE CASSEROLES FROM MCCOY’S GRAYSTONE DINNERWARE LINE! BOTTOMS ARE MARKED 7050, MCCOY, LANCASTER COLONY (MARK), USA. CASSEROLES ARE IN NEW, UNUSED CONDITION – SUPER! EXCELLENT CONDITION MCCOY CASSEROLE! 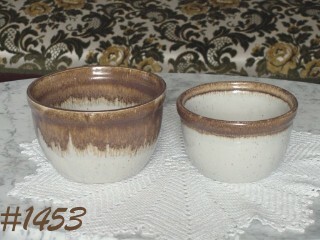 IT’S FROM THE PRETTY GRAYSTONE DINNERWARE LINE AND BOTTOM IS MARKED: 1421, MCCOY, LANCASTER COLONY (MARK), USA. CASSEROLE LOOKS NEW AND UNUSED! 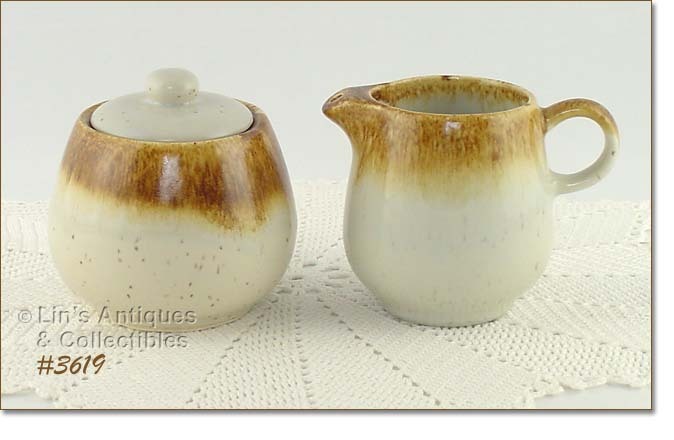 EXCELLENT CONDITION MCCOY CREAMER AND SUGAR! THESE ARE FROM THE PRETTY GRAYSTONE DINNERWARE LINE. 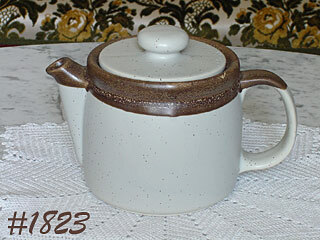 EXCELLENT CONDITION TEA POT FROM MCCOY’S GRAYSTONE DINNERWARE LINE! BOTTOM IS MARKED 1418, MCCOY, LANCASTER COLONY (MARK), USA. SUPER! MINT CONDITION MCCOY SHAKER SET! THESE ARE FROM THE PRETTY GRAYSTONE DINNERWARE LINE AND ARE STILL IN THE ORIGINAL BOX. SHAKERS ARE TABLE SIZE (2 ¼” TALL) AND ARE SHAPED TO FIT COMFORTABLY IN YOUR HAND. EXCELLENT! 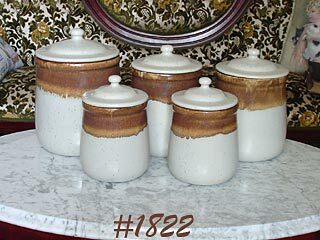 EXCELLENT CONDITION SHAKER SET FROM MCCOY’S GRAYSTONE DINNERWARE LINE! SHAKERS MEASURES 3 5/8” TALL AND STILL HAVE THE ORIGINAL PLASTIC STOPPERS. THE SALT SHAKER HAS A NON-GLAZED/COLOR SPOT ON TWO OF THE SHAKER HOLES – PRODUCTION AND NOT DETRIMENTAL. SET APPEARS TO BE NEW AND UNUSED! MCCOY’S ROUND SHAPED MARGARINE CONTAINERS ARE DIFFICULT TO FIND! THIS ONE IS FROM THE PRETTY GRAYSTONE LINE AND IS MARKED MCCOY, LANCASTER COLONY (MARK). IT’S IN WONDERFUL CONDITION – NO CHIPS, NO CRACKS – HAS MINOR CRAZING AND A COUPLE OF CRAZE MARKS ON BOTTOM. SUPER ITEM! LOVELY COLORS ON THIS MCCOY DINNERWARE FROM THE GRAYSTONE LINE! THIS IS A SERVICE FOR 4 (20 PIECES) – 4 DINNER PLATES, 4 BREAD/DESSERTS, 4 BOWLS, 4 SAUCERS, AND 4 CUPS. 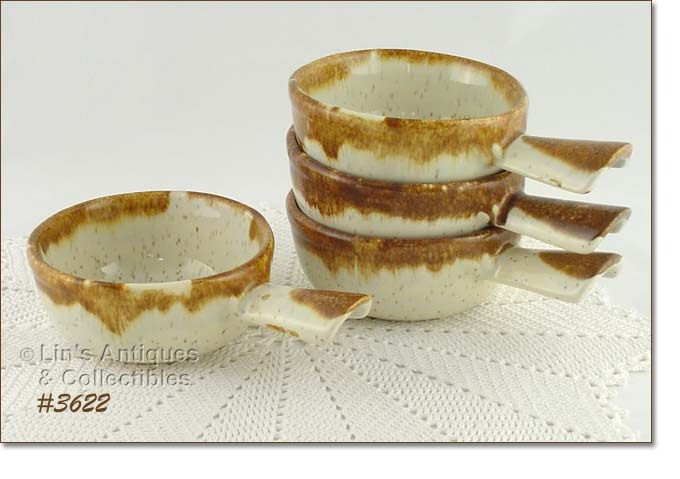 THEY ARE IN WONDERFUL CONDITION – PLATES HAVE MINOR UTENSIL MARKS (NOT UNCOMMON) AND 1 CUP HAS SOME INTERIOR CRAZING. NICE! SET OF 4 MCCOY SOUP/SALAD BOWLS FROM THE PRETTY GRAYSTONE LINE! BOWLS ARE IN EXCELLENT CONDITION. 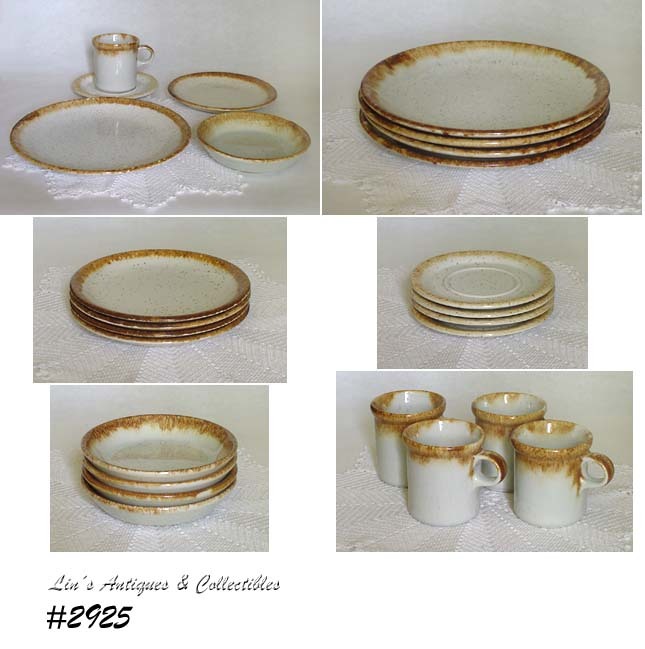 THIS LISTING HAS AN ASSORTMENT OF DINNERWARE ITEMS FROM MCCOY’S PRETTY GRAYSTONE LINE! 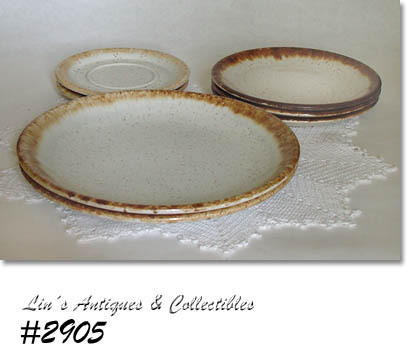 PIECES ARE PRICED INDIVIDUALLY – THERE ARE 2 DINNER PLATES SOLD, BREAD/DESSERT PLATES (SOLD), AND 2 SAUCERS @$5 EACH. 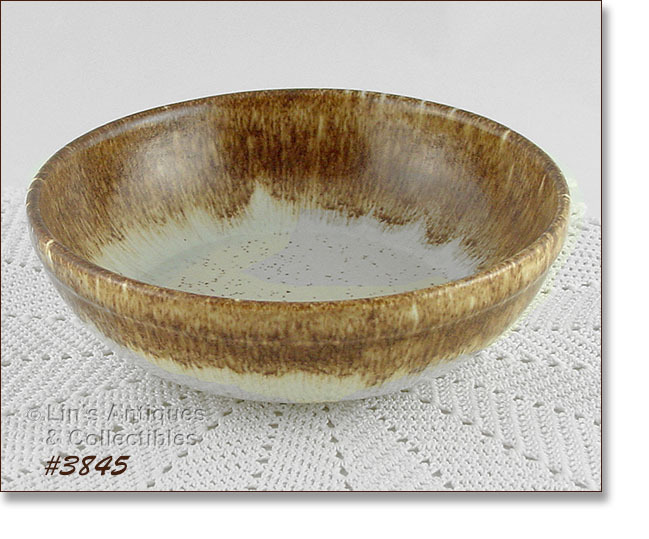 ITEMS ARE IN WONDERFUL CONDITION – NO CHIPS, NO CRACKS – PLATES HAVE MINOR UTENSIL MARKS, NOT UNUSUAL AND NOT DETRIMENTAL. 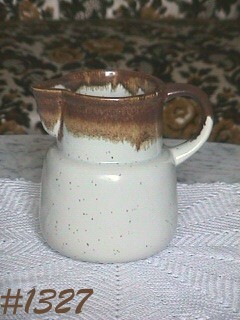 MINT CONDITION PITCHER FROM MCCOY'S GRAYSTONE LINE! PITCHER MEASURES 6" TALL AND HAS THE MORE BULBOUS SHAPE BOTTOM. MARKED: MCCOY, LANCASTER COLONY (MARK), USA. ABSOLUTELY MINT -- NO CHIPS, NO CRACKS, NO CRAZING! LOOKS NEW. PRETTY MCCOY GRAYSTONE PITCHER! MEASURES 6" TALL AND HAS BEAUTIFUL COLORS. MARKED ON BOTTOM: MCCOY, LANCASTER COLONY (MARK), USA. IN EXCELLENT CONDITION -- HAS NO CHIPS, NO CRACKS, NO CRAZING -- LOOKS NEW AND UNUSED! HAS A TINY DOT SIZE PRODUCTION BUBBLE ON RIM BY HANDLE -- OF NO CONSEQUENCE AND REALLY NOT WORTH MENTIONING. SUPER NICE ITEM. BEAUTIFUL MCCOY GRAYSTONE TEA POT IN THE 6 CUP SIZE! MARKED ON BOTTOM: 1418, MCCOY, LANCASTER COLONY (MARK), USA. 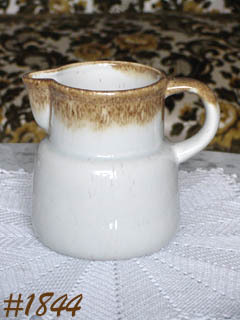 EXCELLENT COLORS -- THE BROWN "DRIP" COLOR IS DARKER THAN USUALLY FOUND AND TEA POT HAS A MATTE FINISH RATHER THAN SHINY. LOOKS NEW AND UNUSED! HAS SOME TYPICAL MCCOY PRODUCTION FLAWS: FEW PIN POPS, A NON-COLOR SPOT ON INNER RIM, AND SOME GLAZE POPS AT BOTTOM DRY RING -- NONE ARE DETRIMENTAL TO USE OR APPEARANCE OF THIS VERY PRETTY TEA POT! BEAUTIFUL MCCOY 5 PIECE CANISTER SET! FROM THE GRAYSTONE LINE OF 1978, SET HAS BEAUTIFUL COLORS. LARGEST CANISTER MEASURES 8" TALL TO RIM (10" TO TOP OF KNOB TYPE HANDLE), NEXT TWO MEASURE 7 1/4" TALL (9" TO TOP OF HANDLE), NEXT TWO MEASURE 6" TALL (7 1/2" TALL TO TOP OF HANDLE). LARGEST ONE IS MARKED: 133, MCCOY, LANCASTER COLONY (MARK), USA. TWO MEDIUM ONES ARE MARKED: 131M, MCCOY, LANCASTER COLONY (MARK), USA. TWO SMALL ONES ARE MARKED: 135, MCCOY, LANCASTER COLONY (MARK), USA. ONE OF THE MEDIUM SIZE CANISTERS DOESN'T HAVE THE RUBBER GASKET/RING. THERE IS A 1/4" PRODUCTION STRESS ON TOP OF LID FOR LARGE CANISTER. THAT'S IT!! THIS SET APPEARS TO HAVE BEEN USED VERY LITTLE AND WAS VERY PAMPERED. VERY NICE NESTED BOWLS FROM MCCOY'S PRETTY GRAYSTONE LINE! SET CONSISTS OF A 1 PINT AND A 1 QUART SIZE. BOTH ARE MARKED MCCOY, BOTH ARE IN GREAT CONDITION. THE 1 QUART HAS A DOT SIZE DING ON RIM EDGE AND BOTH HAVE VERY, VERY MINOR CRAZING ON INSIDE BOTTOM -- THAT'S IT! ANOTHER BEAUTIFUL MCCOY ITEM FROM THE GRAYSTONE LINE! PITCHER MEASURES 6" TALL, 4 3/4" DIAMETER (AT TOP). MARKED ON BOTTOM: MCCOY, LANCASTER COLONY (MARK), USA. PITCHER LOOKS NEW! WITH THE EXCEPTION OF A "NOT WORTH MENTIONING" DING ON BOTTOM DRY (SETTING) RING, IT IS IN MINT CONDITION. WONDERFUL COLORS! MCCOY'S GRAYSTONE LINE HAS SUCH BEAUTIFUL COLORS AS CAN BE SEEN ON THIS TEA POT AND TWO MATCHING MUGS! 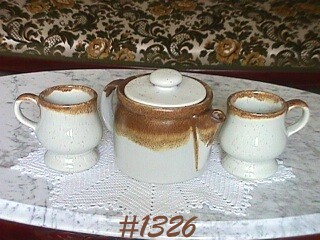 TEA POT IS MARKED ON BOTTOM: 1418, MCCOY, LANCASTER COLONY (MARK), USA. MUGS ARE MARKED: 7112, MCCOY, LANCASTER COLONY (MARK), USA. TEA POT AND MUGS LOOK NEW! MUGS HAVE VERY MINOR CRAZING INSIDE BOTTOM, TEA POT HAS A FEW TYPICAL MCCOY PIN POPS -- NOT DETRIMENTAL IN ANY WAY. AN EXCEPTIONAL SET! SUPER NICE COVERED CASSEROLE AND UNDER PLATE FROM MCCOY'S BEAUTIFUL GRAYSTONE LINE. CASSEROLE IS MARKED ON BOTTOM: 1421, MCCOY, LANCASTER COLONY (MARK), USA. HAS NO CHIPS, NO CRACKS, VERY MINOR INTERIOR CRAZING -- ACTUALLY APPEARS UNUSED! PLATE IS MARKED: USA, MEASURES 10 3/8" DIAMETER. IN GREAT SHAPE -- HAS A CHIP ON BOTTOM (SETTING) RING THAT DOESN'T EFFECT USE OR APPEARANCE. BOTH PIECES HAVE BEAUTIFUL COLOR!